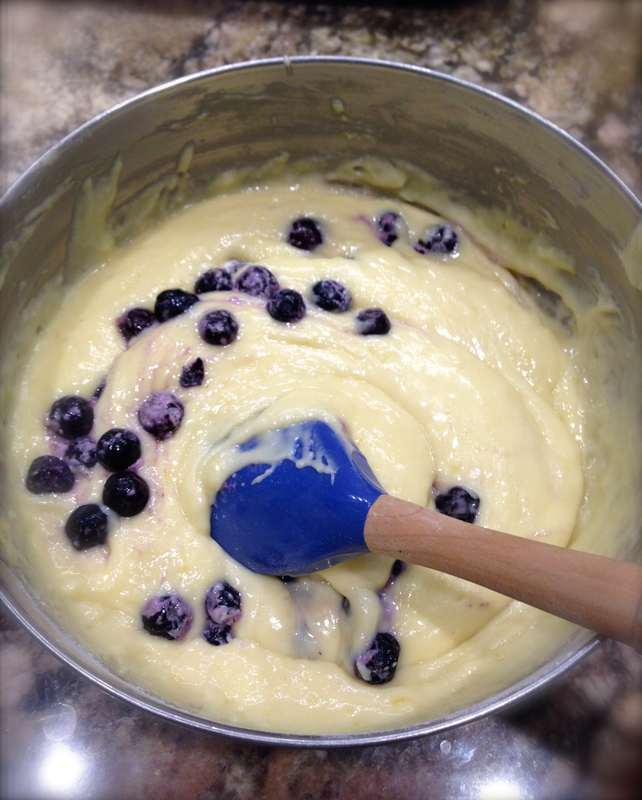 Lemon Blueberry Yogurt Loaf… – You Betcha Can Make This! Being forced to take it easy after spinal surgery has its advantages and disadvantages. For the life of me I never thought I would feel guilty just taking it easy. It’s made me realize that our lives are so full and programmed that once you’re forced to just relax and heal it feels very strange – and it’s also very hard. The one could thing about my recuperation is I am relatively mobile. I have to be careful with my movement, no bending or twisting and the waist, and no lifting anything over ten pounds. But other than that my activity is based on what I think my body can tolerate and how I feel. The key is to try to continually build up my strength and activity. And what kind of activity has in recent years become a passion of mine? Well, cooking and baking of course! So today instead of just loafing around it was time to get active and make a loaf, a lemon blueberry yogurt loaf to be exact. This recipe comes from a website called Sweet Peas in the Kitchen and I found it on Pinterest (surprise, surprise). What intrigued me about the recipe was the process for making the loaf. 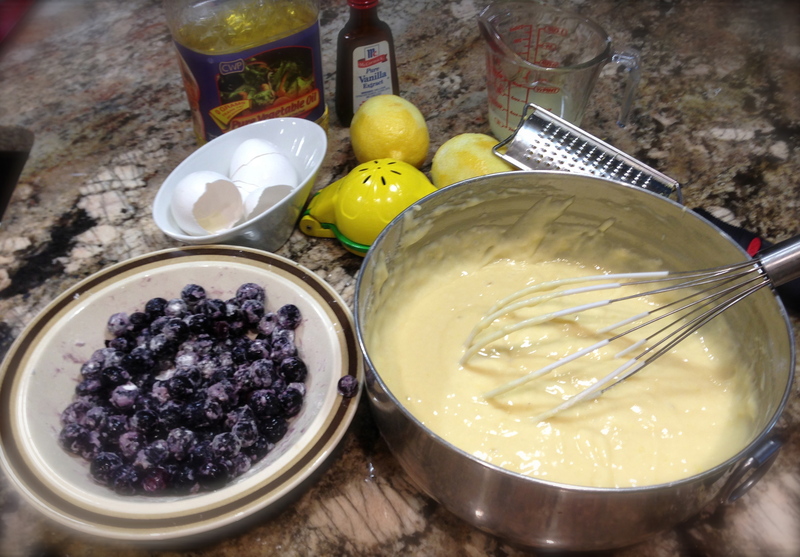 The ingredients consist of all the usual suspects, flour, sugar, lemon juice and zest, yogurt, eggs, vanilla, blueberries and such. But the interesting part of making this loaf is what you do to it once it comes out of the oven. 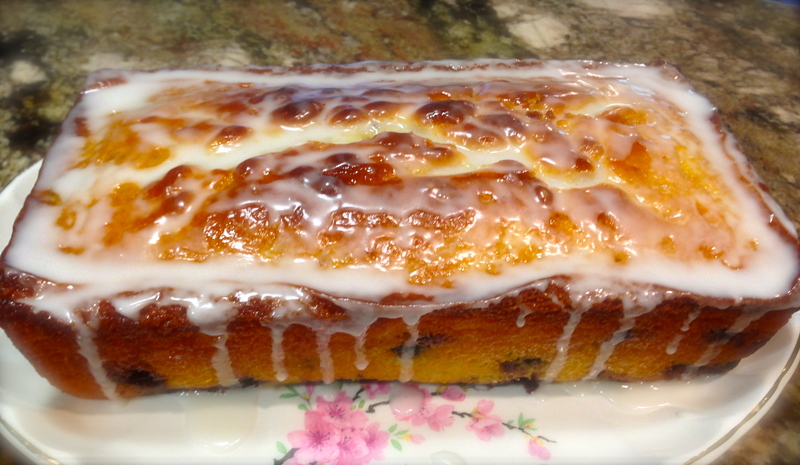 This recipe calls for making a lemon sugar syrup that you cook on the stove and brush all over the loaf after you’ve thoroughly pierced it with a toothpick. Once the syrup soaks in you continue the process again until the syrup is completely used up. The idea here is to add moisture to the inside of the loaf after it bakes. This was a new one for me. Then once the loaf is completely cooled you make a simple lemon juice and confectioners sugar glaze and drizzle it all over. Sounded interesting, so I had to try it. As with all recipes I get from Pinterest, once I initially try them I like to rate them and talk briefly about some lessons I learned while making them. So, first the RATING: A. I really like this recipe. It is easy and very flavorful. You know when you lick the batter and it’s yummy that you’ve got a winner on your hands. This is definitely one to put into your recipe box. 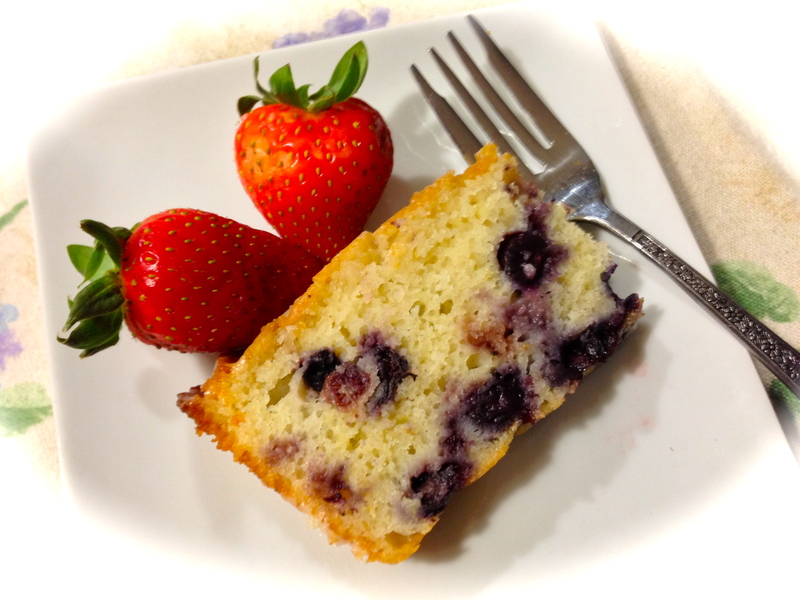 Lessons Learned: 1 : The recipe calls for fresh or frozen blueberries rinsed and coated with a little flour, a common trick to get the blueberries not to gather at the bottom of the cake while its baking. I couldn’t find fresh blueberries so I opted for frozen. Frozen ones are mushier and wetter and so next time I will use fresh blueberries. Although my blueberries did not totally sink the the bottom, they definitely showed a propensity to being there and I’m thinking fresh blueberries will be drier and because of that more evenly distribute themselves in the loaf. 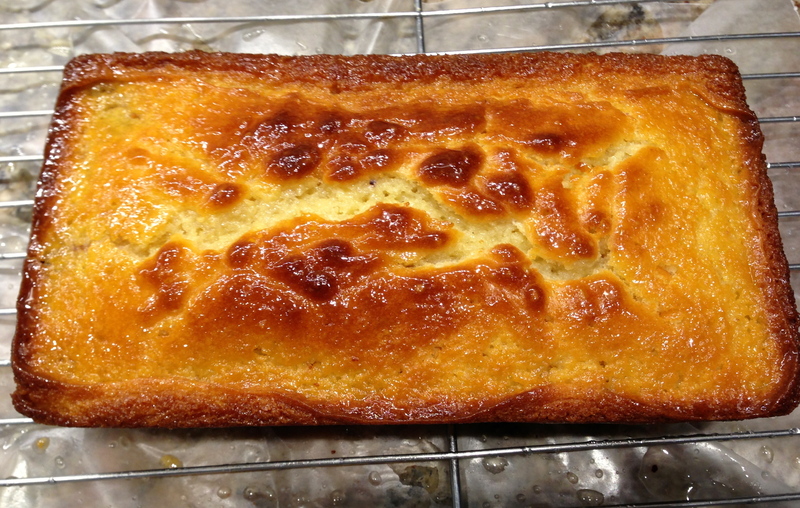 Lesson Learned 2: I was intrigued by the process of piercing the warm loaf and brushing it with a lemon sugar syrup. I’d never heard of using this type of technique to infuse moisture into a loaf once it’s baked. I found that it does indeed add moisture but felt that using the entire amount was not necessary. The recipe calls for a mixture of 1/3 cup lemon juice and 1/3 cup sugar cooked on the stove and applied until gone. I would decrease that to 1/4 cup each and maybe even after some experimentation to 1/8 of a cup. I definitely don’ t think you need all of it, but try it and see what you think. Lesson Learned 3: Note to self. I need to get a new loaf pan. I currently use a dark one and it tends to really cook the edges of loaves much faster than the center and so my edges tend to get very crispy before the center is completely done. I want to try either a glass or just light metal pan to see if it makes a difference. I have a feeling it will. Have you any thoughts on what works best? All in all, as you can see by the final product below, I am very pleased with the way it turned out considering it was the first time I made it. You should add this recipe to your repertoire – it’s a keeper!